It's fall in North America-wild creatures are looking for winter lodging and maybe rustling up your tulip bulbs, fallen tree nuts and other goodies to stay full and fed. Do watch your pets if they are left outside as they may come across a wild creature not interested in their contact. Saskatchewan dogs got porcupine quills when they disturbed a porcupine in an unused building. The veterinary bill is expected to exceed $10,000 Cdn. The dogs, Mahalo, Nestah, and Soljah, were out walking near their home in Craven, Sask., when nine-year-old Soljah discovered a porcupine hiding in an abandoned barn. The curious canine gave the porcupine a good sniff, and was rewarded with a few quills to the chin. Soljah naturally let out a yelp — and that's when things really took a turn for the worse. "The dogs went into protect-the-older brother mode, and it went bad," Mazur said. The dogs in Seattle can get their owners to purchase dog treats from a food truck just for them! Popular offerings include air-fried chicken feet and duck neck, cupcakes with bacon rebranded “pupcakes,” mini cheesy doughnuts, pumpkin pretzels and peanut butter-banana cookies. Sad outcome to the bison calf story-people, if you want to help or handle wild animals, use gloves so your oils don't mark the creature for rejection by its family! Monday, May 16, 2016, 3:17 PM -	In a press release issued Monday, Yosemite Park officials announced a baby bison had to be euthanized after a pair of tourists put the animal in their car, fearing it was cold. "The bison calf was later euthanized because it was abandoned and causing a dangerous situation by continually approaching people and cars along the roadway," park officials said in a press release. Officials tried numerous times to re-integrate the kidnapped bison back into the pack, but it was rejected by the herd. A better outcome resulted for a cygnet (baby swan) that was spotted with a fish hook in its beak-Twitter posts were seen by people able to come to the bird's assistance and yes they used gloves! Fireworks and the sounds of thunder are two sounds that can scare some dogs. There is news of a drug that can help to reduce the anxious response in dogs when these sounds happen. For Americans of the four-legged kind, Independence Day night is closer in tone to director Roland Emmerich's visions of alien invasion. And, like the new sequel, it's full of explosions and terror but light on fun. "Loud bangs and whistles can not only cause pain in their ears but can also make the bravest of pets frightened," David Neck, a small-animal specialist with the Australian Veterinary Association, said in a statement. July 5 is, in fact, widely reported to be the busiest day for animal shelters in the United States. As dog owners may know, roughly a third of dogs are susceptible to what veterinarians call noise aversion. When exposed to loud sounds, the pooches may shake, whine or, worse, scamper free from their leashes and homes in search of safer havens. Fireworks are a powerful trigger. On a typical weekend in San Diego, for instance, the county shelter takes in roughly three dozen dogs. In the days after the Fourth, the number of lost dogs increases to 70 or 80 animals. Spain's 2016 running of the bulls was held earlier this week. There were injuries of course in the contained course as the bulls split up to chase whoever was in their paths. In the bull ring, a young Spanish matador was knocked down by a bull and gored in the chest, leading to the man's death. Do most people know that some communities may have bylaws/ordinances that don't allow residents to keep pot-bellied pigs as pets? A lengthy standoff between a slithering escapee and city staff in Victoria ended in an impasse Thursday, but crews hoped bait laid out overnight would still help them catch the creature. It started Wednesday night when a technician investigating a sinkhole stuck a camera down a storm drain near Quadra and Mason streets – only to discover a massive snake. 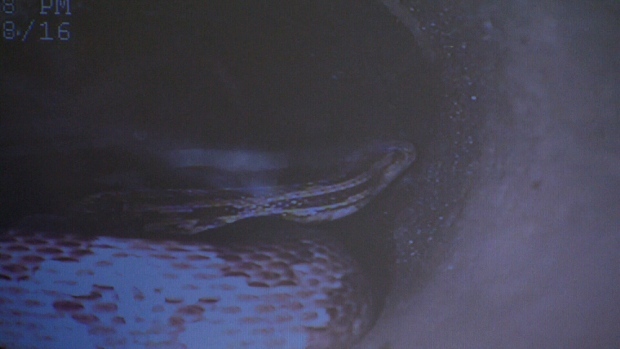 Mike Ippen, Victoria’s manager of utility operations, said the snake had travelled about four metres into the run of the pipe. I have seen the tape and looks more like a boa or python to me, but it's dark down there, so the mystery will continue. A big white T painted on the road above the snake is the only lead to it's location. Poor thing, hope they rescue it soon. What a patio (outdoor living space) is to humans, a catio is for cats but with enclosures. So both humans and cats can enjoy the outdoors without crossing paths. An economic downturn in an area can lead residents to making decisions about pets when cash or savings run out while unemployed. In Alberta, there is an increase in owners surrendering pets when they run out of means to keep the pets as the job losses or unemployment situation continue. Ginter worries things are going to get worse for those hurt by Alberta's economic downturn because soon many will no longer be eligible for employment insurance. McIntosh said there are about 400 animals in the shelter on any given day. Most are cats, but exotic or expensive pets such as snakes and reptiles are also growing in number. "They get very, very big. They're very expensive to care for and they're not able to maintain that care, so they surrender them to us. They take longer to adopt, so we do have a lot of exotics right now."